This is the randomizer you’ve been waiting for. In a previous post, I’ve created a list of tips on how to get your creative juices warmed up for design work. Creativity, after all, is like a muscle that should be trained, or else it would get out of shape. When I was writing the article however, I was looking for a website that gives quick and simple sample design briefs that designers could use as an exercise but I never found any. A fellow designer did exactly that. 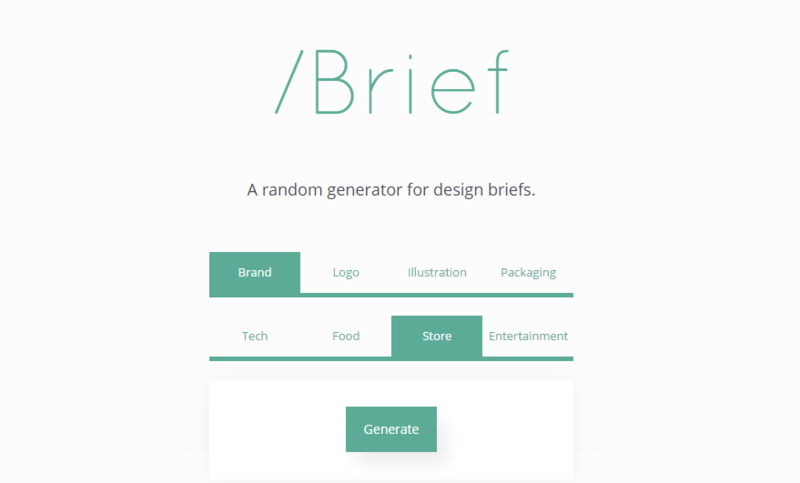 Florida-based designer Manuel Oppel del Rio created Brief, a random design brief generator that gives a document with all the specifications for the design that a hypothetical client would require. The generator lets you choose from four different types of design work—the brand’s visual identity, the logo, illustrations for advertisements, and product packaging. You can also choose from four different industries—Tech, Food, Store, and Entertainment. Manuel said that the main challenge of the project was generating random sentences. “I went with the obvious solution: writing stock phrases and then just changing key words. Kinda like madlibs.” By combining different key words together, the generator can create semi-unique design briefs each click. Now, if only it would send me emails to make the color pop and the logo bigger everyday. What would be a good feature you would like to be included in Manuel’s project? Comment below!